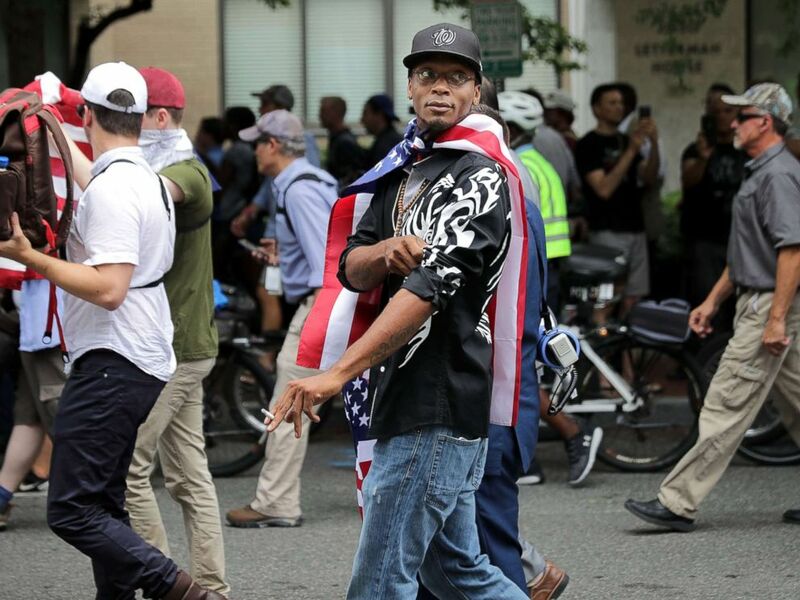 Brandon Watson, clad in all black and wearing an American flag as a cape stood out as he marched and spoke alongside the Unite the Right leaders in Lafayette Park across from the White House on Sunday. DC Metro Police form a protective phalanx around "Unite the Right" rally participants as they march to the White House, Aug. 12, 2018, in Washington, DC. However, Watson, who is black, said he felt it was important to stand with the group to support freedom of speech. He walked side-by-side rally organizer Jason Kessler as the group marched from Foggy Bottom to Lafayette Park. 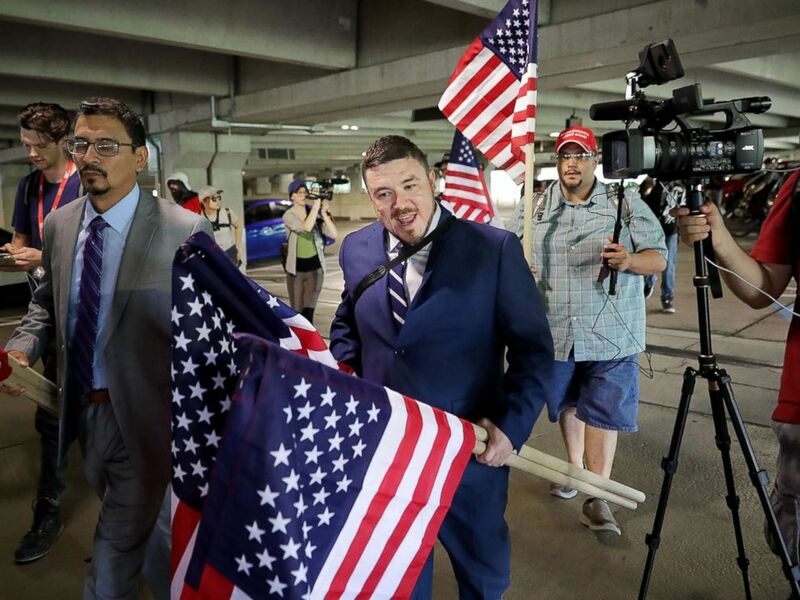 Surrounded by his supporters, reporters, and Fairfax County Police, Jason Kessler walks toward the Vienna/Fairfax GMU Metro Station to travel to the White House for his "Unite the Right" rally, Aug. 12, 2018, in Vienna, Virginia. As he spoke the chants of counter-protesters echoed from across the park as hundreds decried the gathering of various groups, including some white supremacist and white nationalist members. 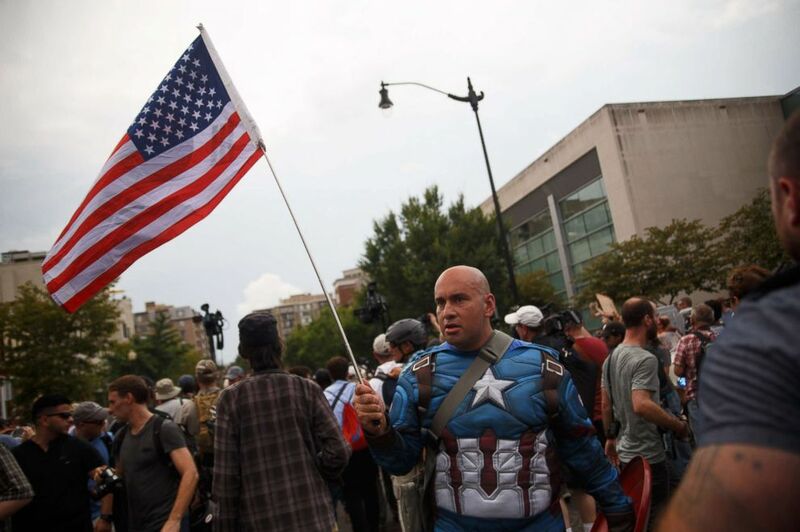 A counterprotester dressed as Captain America taunts white supremacists, escorted by police, who are making their way from Foggy Bottom Metro station to Lafayette Park for a "Unite the Right" event on Aug. 12, 2018, in Washington, D.C.